We invite you to get creative-experience painting on location. Celebrate your creativity & enjoy the company of artists in this unique immersive experience. Attend all or any of 'paint out' days at beautiful selected locations July 3-7 2019. Hang your work at the exhibition & sale and be eligible for one of many the awards with a grand prize $1500! For art supporters, this is a great opportunity to purchase an original work of art at the exhibition & sale held at Kings Playhouse, Georgetown. Stay up to date and follow our Festival on Facebook, Twitter, and Instagram accounts! Welcome meet and greet reception. Attendance to the awards reception. Registration cost is $50.00. After May 1st it is $65.00. Welcome to the 6th Annual 2019 Points East Plein Air and on behalf of the coordinators, we sincerely wish that you will make this festival an annual pilgrimage in the future. 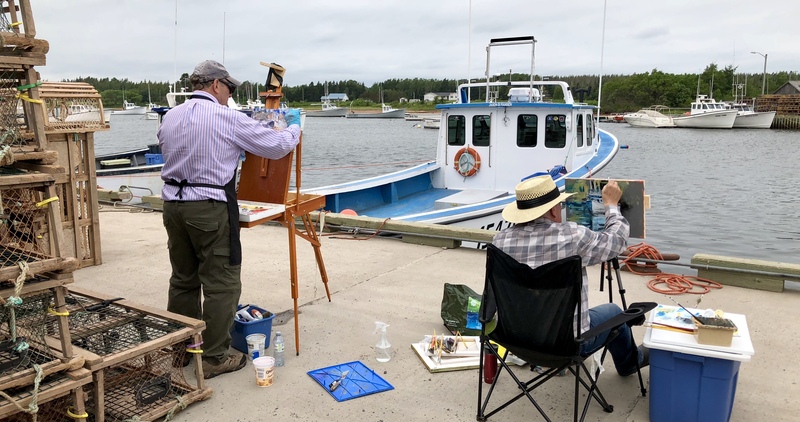 Making new friends, develop your skills as a painter and enjoy the outdoor painting experience in Prince Edward Island. All artists must register, sign-in if pre-registered, on arrival. Each blank canvas, or painting surface intended to be used by entrants will be inspected for complete “blankness” and marked with a stamp at the beginning of each days painting. A color surface with gesso is permitted. Use of reference photos at work area is not allowed. Artwork may not be completed from reference photos and must be a direct painting of the scene surrounding the artist. Artwork must be either framed or have finished edges and be ready to hang. Artists may create as many works as desired. A limit of 4 pieces of artwork may be entered for judging portion of the Festival. Only two-dimensional artwork will be accepted. No photography or prints permitted. All artwork must be completed in an outdoor setting at the festival venues. It is the responsibility of the artist to get permission needed to paint on private properties. The festival is not responsible for the artwork. All art is owned by the artist, and any damages that may occur to the art are the responsibility of the artist. Pricing of all artwork is at the discretion of the artist. The Plein-Air Festival, will handle all sales and collect a 25% commission. Artists of the works awarded prizes, will allow the Festival the use of photos, of the art, for promotional purposes. Any works entered for final judging must have the official stamp.